In the mouth, we chew and moisten solid food until it becomes a small mass known as a bolus. When we swallow each bolus, it then passes through the esophagus to the stomach where it is stored along with other boluses and liquids from the same meal. The size of the stomach varies from person to person, but on average it can comfortably contain 1-2 liters of food and liquid during a meal. When stretched to its maximum capacity by a large meal or overeating, the stomach may hold up to 3-4 liters. Distention of the stomach to its maximum size makes digestion difficult, as the stomach cannot easily contract to mix food properly and leads to feelings of discomfort. After the stomach has been filled with food from a meal, it stores the food for about 1-2 hours. During this time, the stomach continues the digestive process that began in the mouth and allows the intestines, pancreas, gallbladder, and liver to prepare to complete the digestive process. 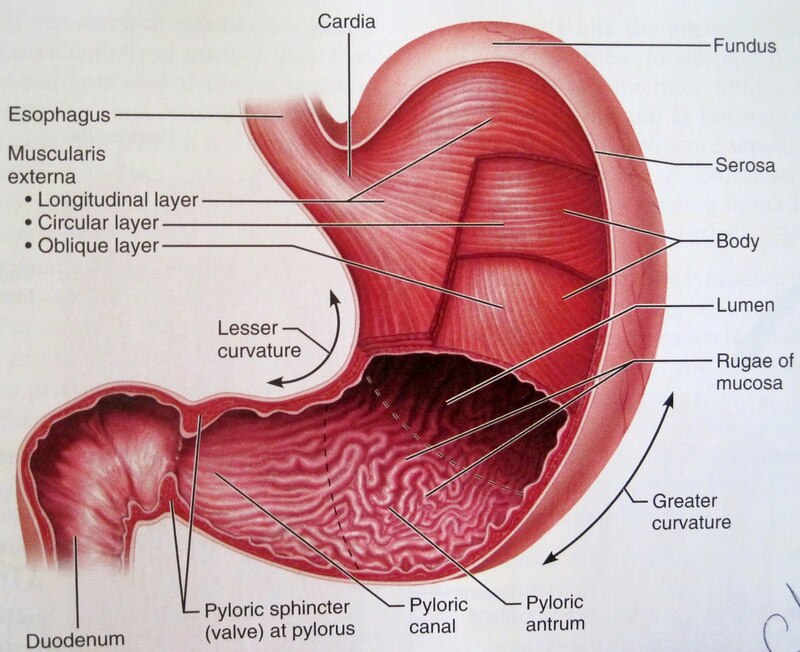 At the inferior end of the stomach, the pyloric sphincter controls the movement of food into the intestines. The pyloric sphincter is normally closed to keep food and stomach secretions within the stomach. Once chyme is ready to leave the stomach, the pyloric sphincter opens to allow a small amount of chyme to pass into the duodenum. This process, known as gastric emptying, slowly repeats over the 1-2 hours that food is stored in the stomach. The slow rate of gastric emptying helps to spread out the volume of chyme being released from the stomach and maximizes the digestion and absorption of nutrients in the intestines. The stomach produces and secretes several important substances to control the digestion of food. Each of these substances is produced by exocrine or endocrine cells found in the mucosa. - The main exocrine product of the stomach is gastric juice – a mixture of mucus, hydrochloric acid, and digestive enzymes. Gastric juice is mixed with food in the stomach to promote digestion. - Specialized exocrine cells of the mucosa known as mucous cells secrete mucus into the lumen of the stomach and into the gastric pits. This mucus spreads across the surface of the mucosa to coat the lining of the stomach with a thick, acid- and enzyme-resistant barrier. Stomach mucus is also rich in bicarbonate ions, which neutralize the pH of stomach acid. - Parietal cells found in the gastric pits of the stomach produce 2 important secretions: intrinsic factor and hydrochloric acid. Intrinsic factor is a glycoprotein that binds to the vitamin B12 in the stomach and allows the vitamin to be absorbed in the small intestine. Vitamin B12 is an essential nutrient for the formation of red blood cells. Hydrochloric acid protects the body by killing pathogenic bacteria naturally found in food. Hydrochloric acid also helps to digest proteins by denaturing them into an unfolded shape that is easier for enzymes to digest. The protein digesting enzyme pepsin is activated by exposure to hydrochloric acid inside the stomach. - Chief cells, also found within the gastric pits of the stomach, produce two digestive enzymes: pepsinogen and gastric lipase. Pepsinogen is the precursor molecule of the very potent protein-digesting enzyme pepsin. Because pepsin would destroy the chief cells that produce it, it is secreted in its inactive pepsinogen form. When pepsinogen reaches the acidic pH found in the stomach thanks to hydrochloric acid, it changes shape and becomes the active enzyme pepsin. Pepsin then breaks dietary proteins into their amino acid building blocks. Gastric lipase is an enzyme that digests fats by removing a fatty acid from a triglyceride molecule. - G cells are endocrine cells found at the bottom of the gastric pits. G cells release the hormone gastrin into the bloodstream in response to many stimuli, such as signals from the vagus nerve; the presence of amino acids in the stomach from digested proteins; and the stretching of the stomach wall during a meal. Gastrin travels through the blood to various receptor cells throughout the stomach where it stimulates the glands and muscles of the stomach. Glandular stimulation by gastrin leads to increased secretion of gastric juice to increase digestion. 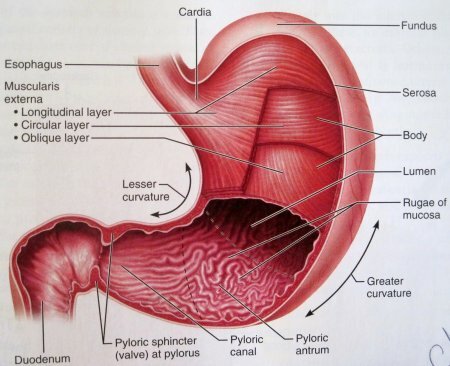 Stimulation of smooth muscles by gastrin leads to stronger contractions of the stomach and the opening of the pyloric sphincter to move food into the duodenum. Gastrin also binds to receptor cells in the pancreas and gallbladder where it increases the secretion of pancreatic juice and bile. Digestion in the stomach can be divided into 2 classes: mechanical digestion and chemical digestion. Mechanical digestion is the physical division of a mass of food into smaller masses while chemical digestion is the chemical conversion of larger molecules into smaller molecules. - The mixing action of the stomach walls allows mechanical digestion to occur in the stomach. The smooth muscles of the stomach produce contractions known as mixing waves that mix the boluses of food with gastric juice. This mixing leads to the production of the thick liquid known as chyme. - While food is being physically mixed with gastric juice to produce chyme, the enzymes present in the gastric juice chemically digest large molecules into their smaller subunits. Gastric lipase splits triglyceride fats into fatty acids and diglycerides. Pepsin breaks proteins into smaller amino acids. The chemical digestion begun in the stomach will not be completed until chyme reaches the intestines, but the stomach prepares hard-to-digest proteins and fats for further digestion. - Gastrin, produced by the G cells of the stomach itself, increases the activity of the stomach by stimulating increased gastric juice production, muscle contraction, and gastric emptying through the pyloric sphincter. - Cholecystokinin (CCK), produced by the mucosa of the duodenum, is a hormone that acts to slow gastric emptying by contracting the pyloric sphincter. CCK is released in response to food rich in proteins and fats, which are difficult for the body to digest. By inhibiting gastric emptying, CCK allows food to be stored in the stomach longer to promote improved digestion by the stomach and to give the pancreas and gallbladder time to release enzymes and bile to increase digestion in the duodenum. - Secretin, another hormone produced by the duodenum's mucosa, responds to the acidity of chyme entering the duodenum from the stomach. Secretin travels through the bloodstream to the stomach where it slows the production of gastric juice by the exocrine glands of the mucosa. Secretin also promotes the production of pancreatic juice and bile that contain acid-neutralizing bicarbonate ions. The net effect of secretin is to protect the intestines from the damaging effects of acidic chyme.